A ring so powerful, it could throw Middle-earth into turmoil all over again. Especially once they build that public transportation system everyone keeps asking for. Rings have become the form factor of choice for wearables that do all kinds of cool stuff. You can find a smart ring to track your calorie intake, to make payments, and even a smart ring using which long-distance couples can feel each other’s heartbeat. Token is a less creepy wearable that boasts a whole array of impressive features, including the ability to use it as a door lock, credit card, and car key. It launched last week, and is available for pre-order right now. Setting up Token seems to be quite simple. You start by using the on-board fingerprint sensor to identify yourself as the owner. One ring can have only one authorized user, for obvious reasons. Once authorized, you can use Token’s mobile app to link your credit card, computer passwords, and any other smart access point. The ring can then be used to carry out transactions that would have otherwise required you to carry around those various other paraphernalia. Token can be charged using an inductive USB charger that comes with the device. The makers claim it last as long as two weeks on a single charge. As soon as you take it off, Token becomes like any other ring (with a sterling silver build and brushed silver finish). That’s a safety measure governed by an infrared sensor that detects when the device is on your hand and when it’s off. Users can get it functioning normally again by logging back in using the fingerprint sensor. So in that sense, Token uses Two Factor Authentication, since it requires your biometric data as well as the physical ring to authorize transactions. All the cool things Token can do is partly a result of the companies with which it has partnerships. The ring integrates with products by Microsoft, Visa (who, if you remember, launched their own payment ring at last year’s Rio Olympics), FitPay, MasterCard, FIDO Alliance, and HID among others. MasterCard and Visa users can use Token instead of their credit card. Microsoft has said that Windows 10 users will be able to login into their computers using the ring. 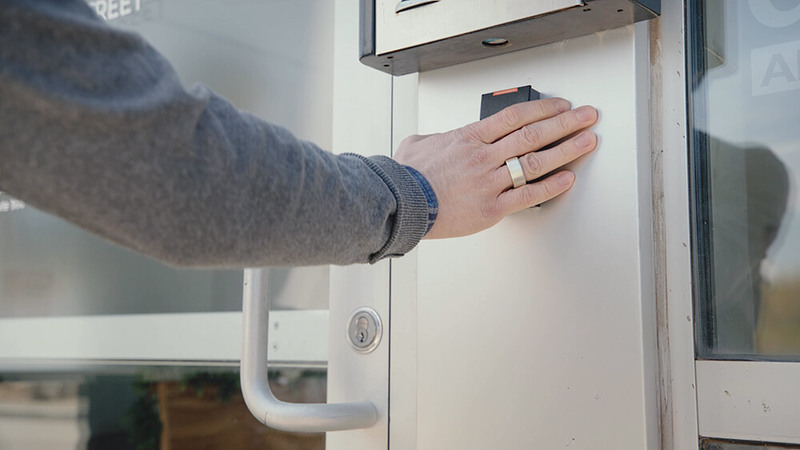 The ring currently works only with Token’s own lock, but support for other smart locks is coming soon. The makers are also working with authorities in different states so Token be used to pay for public transit. Miami, Salt Lake City, Philadelphia, and Chicago are expected to support payments using the ring by the end of 2017. New York City could join that list in early 2018. The Token smart ring is currently available for pre-order via the website for $249 as part of a sale that ends in about a week. The door lock and car lock come as optional accessories, each of which is priced an additional $100. You can also pay extra to do better than the standard brushed finish; it’s $50 to get the Black Rhodium or Rose Gold finish. The rings come in seven different sizes, and sizer kits are sent out prior delivery so there aren’t issues with the fit. Pre-ordered units are expected to ship in the USA by December this year, while a full release is scheduled for spring of 2018. Deliveries to global markets will be introduced soon, of which you can be notified by dropping your email here. Oh it works! There is a very simple technology situation going on here. I like it! There is a lot of promise with a device like this. Soon, companies will be trying to pack more features into something so small and you will want to get rid of things like your remote control, car keys and such. Partnering up with big companies like MasterCard is a great thing for success. Other companies that will see that might sign in just because of that trust another company has. This is true and the fact that the ring seems to have some nice securty features built into it already. At first, I thought this was just another copy cat product that stores all my personal information, but then I read about all the companies that are partnering up with them and that is pretty impressive! Its a good idea. I like the fact that I do not have to have my smartphone with me and can complete similar actions with this ring.